With its small form factor, this USB 3.0 Mini 4-Port Hub is a rugged mountable hub compact enough to be mounted anywhere a 5″ area is available. 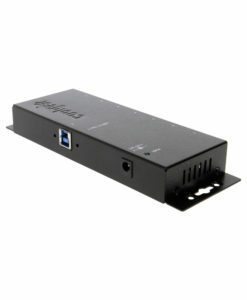 USB 3.0 compliant hub adding 4 downstream ports with up to 5Gbps . Rugged and Mountable metal case. LED Status indicators for each USB 3.0 Port. Slim 4-Port USB 3.0 Mini Super-Speed Hub with Power Adapter and 3ft. USB 3.0 cable included Connect your USB peripherals 40 times faster. Metal Case with Mounting Flanges, Metal USB 3.0 Hub with High Current 4000ma Power Adapter UL and FCC listed Ultra Fast GL 3520 CHIP, USB.org Certified USB 3.0 4 port Hub. This product has been designed to be connected a computer with USB interfaces. It serves to connect additional USB devices. During operation it operates like a bi-directional repeater, which repeats USB signals as required on upstream (computer) and downstream (peripherals) cables. It is designed for USB 3.0 and backward compatible with USB 2.0 and USB 1.1. Its operation requires connection with a computer. This is a good little hub, solidly built, and fast. There’s not much to tell about this little hub; it’s good for an environment where it might get bumped or hit, and can be mounted to ensure it doesn’t get knocked across the room when it’s bumped or hit! I imagine most people who would be interested in this one, is because it’s mountable. Indeed, it has 4 little slots for where screws would go to mount it. But I dug around in my drawers for some screws that would fit it, and eventually was able to mount it where I needed it, and it has been working great ever since! I wish the included cable was a bit longer, so consider getting a USB 3.0 extension cable (I got one from Amazon, works great). Considering you get no screws, a short cable, and only 4 ports, the (current) $34 price tag seems a bit high, but for what it’s intended for, it works great. Because of its small size, I decided to purchase this mini hub. After using it, this is a great 4 port mini USB 3.0 hub for tight space applications or organized connections for several of your USB 3.0/2.0 devices. I was surprised to find a Sunday delivery, the item had been delivered in a padded envelop boxed in the manufacture’s box. The item’s box itself was a thin white box approximately 8 inches long by 1 1/2 inch high. The Mini Hub is small enough that will fit into a small space no bigger than your open hand. The USB 3.0 cable connectors are a tight connection into the USB 3.0 Mini-B port as is the power supply connector needed when using the hub for devices with higher constant power consumption requirements. I used a Windows 8.0/8.1 (ASUS) laptop with the operation of this hub. My basic process with hubs is to connect the USB cable to the hub, then the cable to the host USB port. This laptop is very quick so I had checked my device manager for the connection; the “Generic SuperSpeed USB Hub” was listed in my Universal Serial Bus Controllers list. I should note that this hub has a (Red) Power LED and becomes brightly illuminated with the hub connected to the computer’s USB port. The power supply this hub comes with is only for additional power, not for initially powering the hub, the USB 3.0 Type-A to Mini-B cable must be connected as this is the medium for transferring the data. This is a 4 port USB 3.0 hub, USB 3.0 is backward compatible with USB 2.0/1.1 devices which is what I am using with this particular hub. Backward compatibility means that the hub will operate USB 2.0 devices through its USB 3.0 ports but will only have USB 2.0 data transfer speed (480Mbps). Once my connection was made, I had plugged in several thumb drives, when a USB device is connected the hub’s corresponding “Green” LED becomes active indicating that particular port is connected. The thumb drive data instantly appeared on my screen and I was able to browse folders very quickly as I would when accessing my hard drive. Using the thumb drives in my case was the intent of purchase of the USB 3.0 mini hub. Although I didn’t mount the hub in any way, it does include mounting flanges as part of its construction to accommodate for mounting to a table top or wall. There are no screws included but looks like standard mounting screws (two on each side) will work. Based on my usage of it so far, this hub has a good, solid chassis construction, all ports including the power port have a tight connection and it is instantly recognized by my Windows system, I did not have to go through a separate installation process for it to do what I needed, switching between data sources was just a matter of opening folders to that thumb drive. Being as small as it is, I would recommend this USB 3.0 4 Port Mini Hub for tight places may require some sort of hub integrated into its equipment or out in the open where multiple port connections need to be made, possible in an office, school or industrial environment. It was operational as soon as I connected it. I found no CONS with this device’s function, worked right out of the box. The 4 port USB 3.0 USB Hub has certain accessories that work with it. These accessories are what you can order if needed.